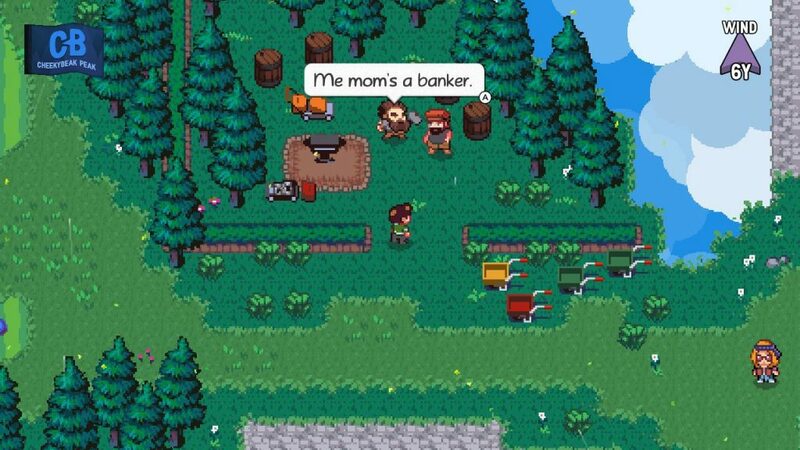 Golf Story is one of those games that makes very little sense on paper. Trying to explain the premise is not an easy task, but it only takes a few moments with the game to realize just how special this game really is. It is a fantastic blend of RPG games of old and the simple game play of Nintendo’s Golf that everybody should give themselves a chance to fall in love with. 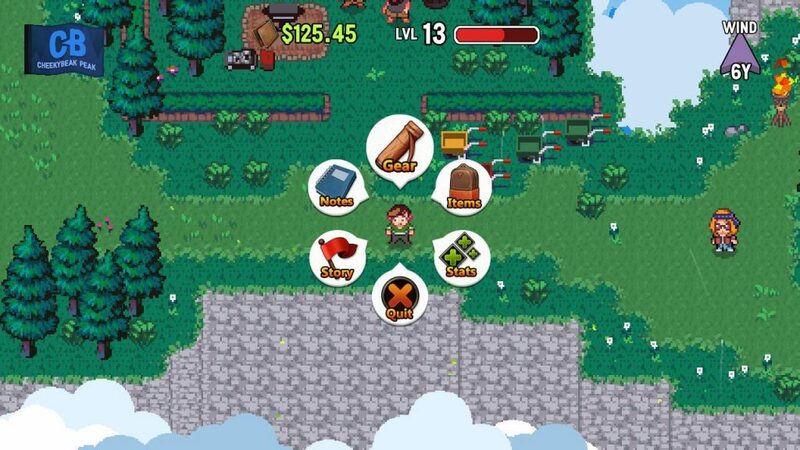 Golf Story follows the journey of a young man who may have been a great golf prodigy in his formative years. As your father teaches you the basics, your natural talent has your father drooling over the possibilities of your future in golf. You start to get the sense that you are the “chosen one”, which is a nice throwback to basically every Final Fantasy game ever made, then abruptly we fade to black and come back 20 years later. Now a young man who has since given up his golfing dreams, you are looking to reclaim your aspirations at the very golf course that your father taught you. But things have changed here at Wellworn Grove, and not for the better. Wellworn Grove is falling apart. Mollrats are stealing balls and chewing the course apart, the owner is more concerned with making money at any cost, and everybody is a cranky-pants. As you make your way through Wellworn Grove you are greeted by people who would rather have nothing to do with you. You want to prove yourself worthy of being coached by the towns coach and you must run around and show off your golf skills, help some people with menial tasks, and help get Wellworn Grove back on top of the golfing world all while acquiring new skills and equipment to help you on your journey to greatness. The writing in Golf Story is cheeky, funny, and all around clever. There are no voice overs, but it uses really clever text tricks to convey emotions otherwise. Chat bubbles will tilt, text would shake, and in some cases the speed of the text will even change to help drive home how a character feels. It is also a nice touch that the main character isn’t a silent protagonist, but rather a goofy character in his own right. There is a strange “Stepford Wives” feel to the townspeople as you progress that leaves you feeling uneasy yet compelled to continue. Unfortunately, you won’t see any choices to make during dialog, which can be a bummer, but Golf Story has a story to tell and we are all along for the ride. The game has you exploring 8 different golf courses, which are basically towns. Each course has a unique set of characters inhabiting them and its own set of crazy challenges. The isometric 2D golf mechanic makes things simple enough, but still has a degree of challenge that is welcomed. Unfortunately, the game doesn’t really utilize the potential hazards on the courses, and it doesn’t give you much information about the green other than wind speed , direction and slope of the ground. This could have you using a little trial and error on some shots, rather than knowing exactly where and how to hit your tee shots. 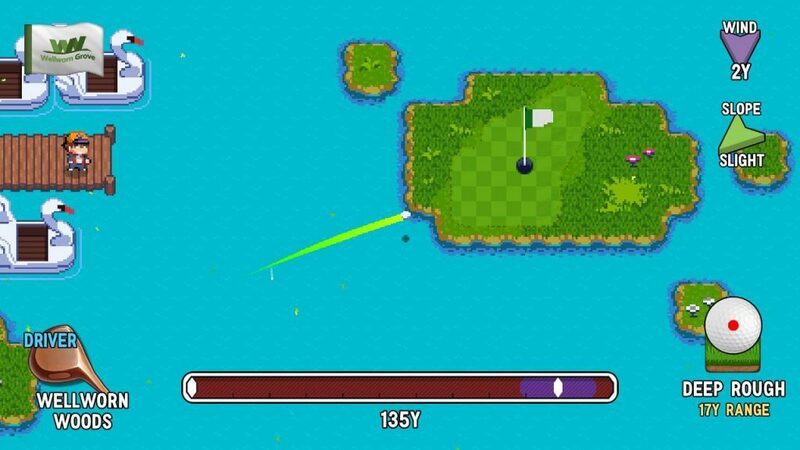 Aside from playing golf matches against CPU opponents, you will complete challenges but nearly all of them involve you trying to hit a certain target with a golf ball or disc (yes there is also Disc Golf). When you complete these tasks you are rewarded with money and experience points. The money can be used to buy better clubs, while experience points level you up so you can increase some stats like Power and Spin. All in all, you level up pretty quickly, but there are no real optional side missions that you can miss, so most players will be leveling up in similar ways. This leaves very little in the re-playability of the single player campaign. The aforementioned single player campaign should take between 12-16 hours to complete, but you won’t really feel compelled to play through it a second time. With that being said, there is some competitive multiplayer but only local, which is a bit of a bummer. 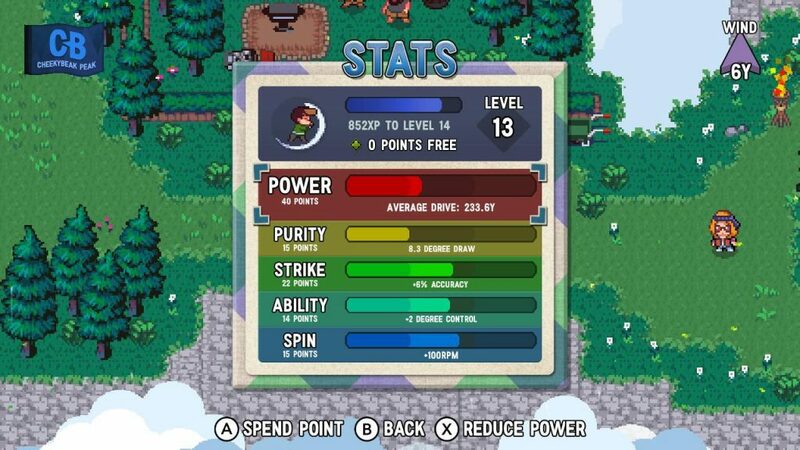 Golf Story is a charming game with a ton to offer fans of both the Golf Genre and the RPG genre, without overbearing the player with the typical tropes of the latter. Its various courses, challenges, and quirky side missions will leave players doing “one more mission” until the wee hours of the morning. I do wish that there were some more varied side missions, however. If you have a switch and want to fall in love with a new franchise that oozes adorable whit, charm, and engaging yet intuitive game play – Golf Story is your game.